Leutnant der Reserve Josef Mai - Fokker DVII - 'Jasta 5' - September 1918. He is seen here standing in front of his famous black and white striped Fokker DVII soon after his promotion on the 27th September 1918. He is perhaps best known as one of the three pilots who made up Jasta 5’s “Golden Triumvirate”. His contribution of 30 confirmed and 15 unconfirmed victories helped make Jasta 5 the third highest scoring German Jasta. Mai flew a variety of aircraft throughout the war including Albatros DV’s, Fokker Dr.1’s and Fokker DVIIs. Mai was prone to paint his planes in a "zebra stripe" pattern,with black and white striping on the fuselage angled to the left viewed from the starboard side. his theory being the optical illusion would help to throw off an enemy pilot's aim. Painted on this background was his insignia of a star and crescent. His Albatros and D.VII were known to bear this paint scheme although his Dr.l paint scheme is uncertain. On 19 August 1918 he had his most successful day. 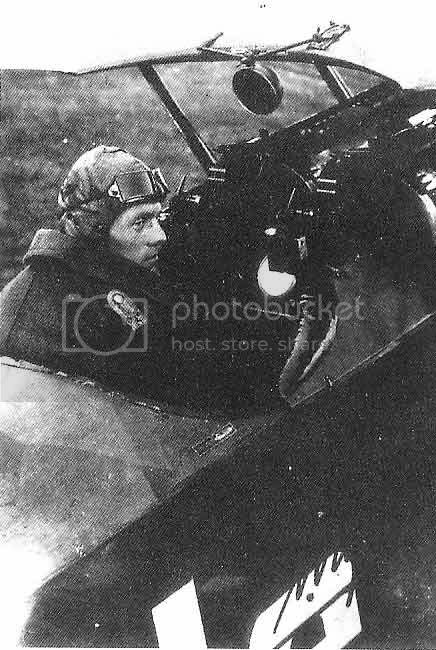 He attacked two Bristol F.2B fighters from No. 48 Squadron, Royal Air Force. As he hit one Brisfit with incendiary ammunition, the other swerved away from the incoming fire and collided with his wrecked companion. Mai followed up this double kill by downing a 56 Squadron SE.5a later. On 3 September he was wounded in action in the left thigh. Nevertheless he scored again two days later, and added five more victories during September. Mai's 26th victory was a No. 64 Squadron SE5a on 5 September 1918. On 27 September 1918, the day of his 29th success, Mai was promoted to Leutnant. His friend Fritz Rumey was also killed in action on that day. Mai claimed his 30th and last score, a Bristol F.2B of 20 Squadron, on 29 September 1918. 15 had been claimed with the Fokker D.VII, 12 with the Albatros and 3 with the Fokker Dr.I. Although Josef Mai was nominated for the Pour le Merite, the “Blue Max”, the war ended before he could receive the award. One Jasta to bring them all and in the darkness bind them. Nick, thanks for posting this. NEVER EVER FLY OVER THE BOMBING TARGET TWICE! That is just asking for it! REMEMBER: The job is never finished until the paperwork is done! I received this info yesterday on Facebook from Drooling Bulldog. He has stunning WWI colour photos. Or send us a link, if they´re on the web!